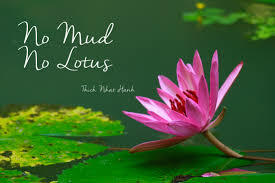 Remember, No Mud, No Lotus. Home » Yoga Thoughts » Remember, No Mud, No Lotus. I used to think of spring as those rare gift, blue sky days, when you are brushed by a breeze as you stop, surprised, by the new growth all around you. And that is certainly part of spring. Perhaps the best part of spring. Certainly the sweetest part of spring. But as the mom of two young dogs, spring has come to mean something else entirely. Mud. Mud, mud and more mud. It means eight black and sticky paws each time I let the dogs back inside. It means two nearly black dogs (that started out white, by the way) each time we go for a romp in the woods. The smell of wet – wet dog, wet socks, wet sneakers – is relentless. While this is not the best part of spring, without it, there could be none of the beauty to come – no growth, no flowering, no rebirth. Though I know deep down inside that the mud and muck are part of the process, knowing doesn’t help me to embrace it. My stomach clenches each time the dogs glimpse a bird out the window and go dashing for the door. Though I know I would benefit from the fresh, clean, almost-warm air and the freedom from these four walls, I find myself thinking twice (actually, I think and re-think a dozen times) before taking the dogs to the woods. When I don’t (and I often don’t), I am as grumpy as the dogs are antsy from being trapped inside. Beauty, the muddy messiness of early spring teaches me, doesn’t always start out beautifully. And, upon reflection, this is widely true. Think about caterpillars, pollywogs and even brand new, wrinkly, red, squished human babies. Joyful beginnings such as spring don’t always start out so joyfully. Think about the stressful, overwhelming, cluelessness of your first days in a new job – especially a new job you thought was the perfect next step. Or the sleepless nights and days filled with relentless demands and the unbelievable messy messes of life with a newborn or even a puppy. When we’re in the mud, we simply have to remind ourselves that within the mucky mess of “now,” the conditions for rebirth are being created. We have to put on our muddy sneakers (metaphorical or not), and squish and squash along with faith that the journey – albeit currently sloppy and unpleasant – is worthwhile. As “plug ugly” as things are right now, each step you take requires hope that conditions will improve. Because I am feeling plagued by actual mud these days, I didn’t have to stretch too far to see my situation in the above Parker Palmer quote. But, dogs aside, it isn’t hard to find some metaphorical mud in my life this early spring. My struggle back into my practice from my illness in January has been more involved and less pleasant than I expected. Like all struggles, it is requiring more patience than I sometimes have. It is taking more persistence than it feels possible to drum up to stick with the journey. In many ways, my practice feels so messy and muck-filled, indeed so “wet and woeful,” that some days I actually “yearn for the return of ice” – in other words, I wish wistfully for the days when my doctors would not allow me to do any yoga at all. But even as that thought flits across my mind, I know it is ridiculous. I know that the only way through the mud is through the mud. I know that the only way forward is step by step. From years of practice, I also know that taking these messy steps through the mud teaches us (no, it requires us) to live optimistically. While we’re in the mud, we have to coax ourselves to notice what beauty we can find. We may have to look up away from our path and focus on the light blue sky. Heck, we may have to close our eyes and just breathe. Whatever our tricks are, we use them. Because when we don’t, we feel trapped, antsy, frustrated and grumpy. Until then, however, have faith and take one sticky, sloppy step at a time.